Oh my, I ended up really liking this one and I was honestly not expecting to like it that much. I was on a fluffy contemporary roll and I picked this up expecting a quick and fluffy read that would be fun but also rather forgetable. BUT I ended up LOVING this book. It made me think of a Morgan Matson book and I adore Morgan Matson books so that’s high praise. 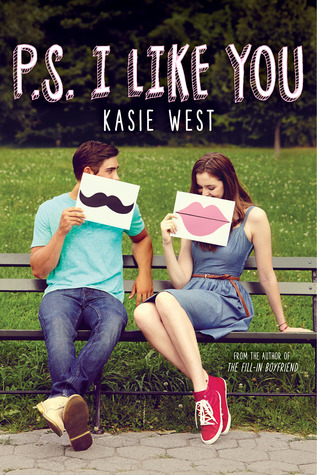 It was my first Kasie West book but I’ll definitely be checking out some of her other books. Let’s see, why did I love this book so much? They connected over music. What starts of as absently scribbling song lyrics on a desk became connecting over a shared love of music and ended up in opening up to eachother about other things as well. But the music connection never stops. The whole book is full of lyrics and song recommendations (fictional songs though, which is a bummer because actual songs would have made it even nicer). A quirky, awkward and relatable main character. I loved Lily. She was a little quirky, kinda awkward but also really funny, nice and relatable. She was straddling the line of stereotypical ‘I make awkwardness cool’ main character for a while, but in the end I just didn’t care, she was super fun and I both loved and related to her. Family shenanigans. Lily’s family has just officially become one of my favorite fictional families ever. They are super present in the story and though it’s not something Lily always appreciates, it was something I most certainly did. Quirky parents, 3 siblings and a pet rabbit come with their own set of hilarious shenanigans and I loved every single family scene we got. Is it a perfect read? No. It still had a best friend whose only function was basically just to talk to Lily about her love drama. She’s hardy developed and we just don’t get to know her well enough (I actually kind of already forgot her name, so that’s saying something). The ending was also dragging things out just a bit too long and featured characters unable to make up their mind and a lack of communication which could have solved everything way faster. So overall, I really liked this book and would recommend it to anyone who’s looking for a quick, fun and fluffy read and who loves: penpall romances, music, quirky characters and family shenanigans. “I’m with you on measuring this week in letters and the two-day drought we are about to experience. If only there was a way to transport letters faster, through some sort of electronic device that codes messages and sends them through the air. But that’s just crazy talk. Have you read P.S. I Like You? What did you think about it?